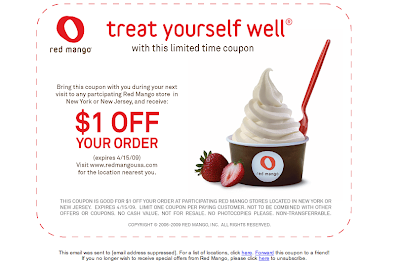 Red Mango Coupon / Hey, EEP! Hop onboard the frozen yogurt train y'all. Winter is slowly thawing out, meaning it's time for your desserts to chill. Truth. With all of the different options of frozen treats these days, it's hard to decide which brand is deserving of your snacking. How will you choose?? Custard, Gelato, Ice Cream, Frozen Yogurt, Soft-serve...I feel like once the temperature goes above 40 degrees, the entire platoon of NYC Mr. Softy trucks are unleashed onto the masses! [Not that I'm complaining of course]The options can be overwhelming at times. One factor that might aid in your frozen dessert selection is pricing. Let's face it, we're not exactly living in a climate that allows for frequent stints of $5 ice cream cones. At many of these locations it's not the price of the yogurt that gets you, it's the $1.00 - $1.50 they tag on per topping. Two of the biggest contenders in terms of the frozen yogurt phase are Red Mango and, of course, Pinkberry. Look at how they match when compared to the high-end gelto shop Grom in the west village. Let me get one thing straight, $5 is not astronomical for an chilled snack if you're treating if like an actual dessert. However if you're grabbing frozen treats once or twice a day in between classes it might add up. Solution: Print off the coupon above and get a great discount on your next sugar rush! Deals have been popping up all over the place for Pinkberry & Red Mango. Something tells me that in the coming months they'll be even more inclined to snag your business with some sweet deals. One last thing to consider: flavor. Personally, I prefer the taste of Red Mango to Pinkberry. To me it has a more "honest" yogurt taste. You can find plain yogurt and green tea yogurt at both retailers. If you're looking to be a bit more adventurous try the coffee yogurt at Pinkberry or the pomegranate yogurt, flavor with POMwonderful, at Red Mango. Enjoy! Red Mango also actually has live yogurt cultures, therefore actually being yogurt! the pomegranate yogurt is indeed fantastic. Thanks for the update Mikhail! I had no idea about the cultures in Red Mango. I knew Pinkberry was sued for not having them, but that's super cool. Yet another reason to go get frozen yogurt...thanks a bunch! no problem, just trying to give credit to where its due. keep up the good work!